Unless you own a specific model of Samsung Smart TV or Sony Android TV, the streaming app Presto had only previously been available on television screens via Chromecast and the recently launched Telstra TV. Well, that’s changed, with the surprise appearance of the Presto app for PS3 and PS4 on the PlayStation store overnight. 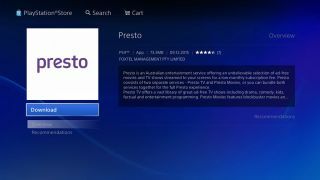 The addition of Presto to the PS3 and PS4’s app library makes Sony’s consoles the only devices that can play all four Australian SVOD services, having already provided access to Netflix, Quickflix and Stan. This edges previous title holder Telstra TV out of the top spot, as the rebadged Roku 2 lacks Quickflix access. If you are a Presto subscriber, it’s worth noting that you’ll likely have to log into your account on the Presto website and sort your registered devices out in order to use the app on your PS3 and PS4 consoles.